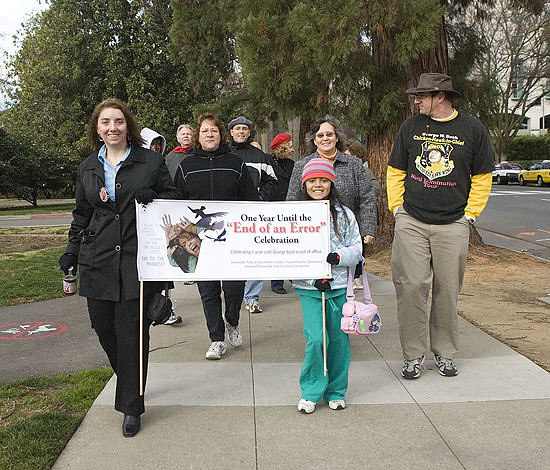 "One Year Before the End of an Error" Celebration-- January 20, 2008. 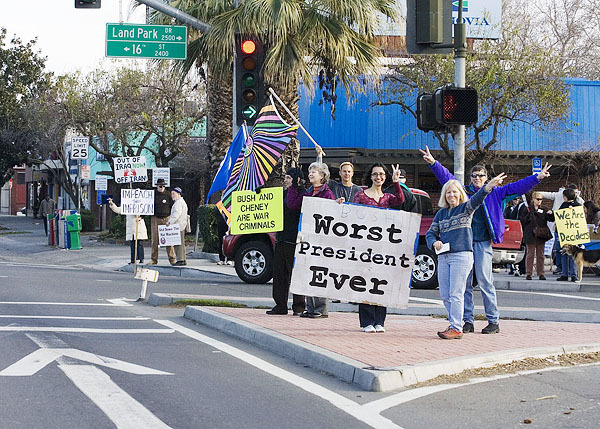 The Stonewall Democratic Club of Greater Sacramento, the Democratic Party of Sacramento County, and Sacramento For Democracy organized a day of events celebrating what is hoped will be a 365 day count-down to the end of George Bush's Reign of Error. The day began at the State Capitol with a speech by Elizabeth Kucinich, wife of Presidential candidate Dennis Kucinich. This was followed by a "Brunch with Assemblymember Dave Jones," and then a "One Year To Go, But End It Now!" Rally at the corner of Broadway & 16th Streets (by the Tower Theater). Wouldn't it be nice if the Tower Theater posted a neon count-down on their marquee? 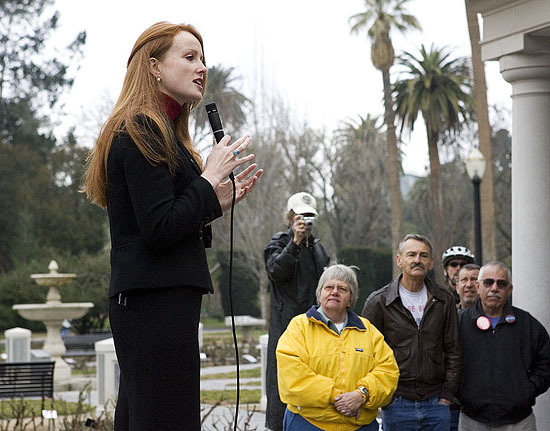 While in Sacramento, Elizabeth Kucinich addressed the issue of NBC's refusal to allow Democratic Presidential candidate Dennis Kucinich to participate in the Las Vegas Democratic Presidential Candidate debate. "NBC is a corporation," Elizabeth said, and as such, might not want to hear about Dennis' position on issues such as healthcare, where he advocates universal single-payer not-for-profit expanded Medicare, or his energy policy, where he voted with the Yucca Mountain caucus against using Yucca Mountain as a repository for spent nuclear fuel and high level radioactive waste. (He favors non-nuclear, green energy technology). Look at who owns NBC and you will see why Dennis was not invited to the Las Vegas debate. Kerri (Democratic Party of Sacramento) and her neice, Trina, in the walk around the Capitol which kicked off the celebration of the "End of an Error." 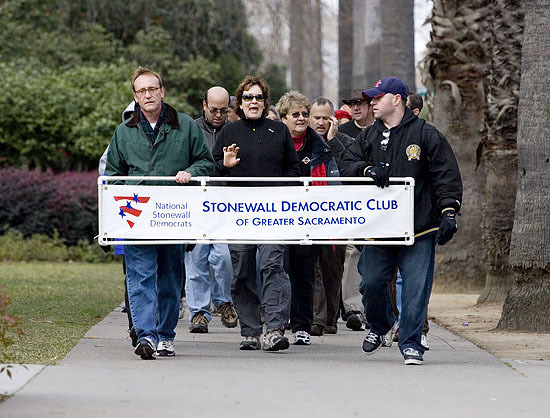 Members of the the Stonewall Democratic Club, co-sponsor of the "End of an Error" day, marching around the State Capitol at the start of the day. The "End of the Error" rally at Broadway & 16th Street published a litany of Bush errors. 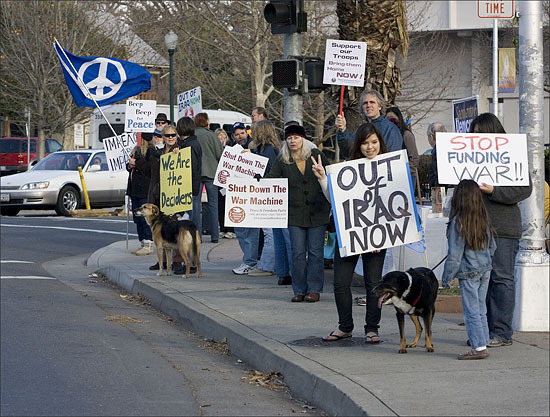 The errors contained in Bush's War on Terrorism include the war in Iraq and the curtailment of civil liberties in the U.S. Many present at the rally would prefer NOT to wait 365 days for the end of the Bush Error, favoring immediate impeachment of Bush & Cheney.